GAAP net income of $48.8 million or $0.79 per diluted share. Adjusted net income, reflecting economic fuel expense and excluding loss on extinguishment of debt, of $37.5 million or $0.61 per diluted share, an increase of $15.1 million or $0.26 cents per diluted share year-over-year. Adjusted pre-tax margin of 10.7% compared to 6.4% in the prior year period. Unrestricted cash, cash equivalents and short-term investments of $606 million. Lowered leverage ratio to 3.4x. Statistical data, as well as a reconciliation of the reported non-GAAP financial measures, can be found in the accompanying tables. $689 million outstanding under secured loan agreements to finance a portion of the purchase price for 11 Airbus A330-200 aircraft. $127 million outstanding under secured loan agreements to finance a portion of the purchase price for 15 Boeing 717-200 aircraft. $100 million in capital lease obligations to finance the acquisition of an Airbus A330-200, two Boeing 717-200 aircraft and aircraft-related equipment. $27 million outstanding under floating rate notes to finance the acquisition of two Boeing 767-300 ER aircraft. $4 million of outstanding convertible senior notes. In the second quarter, the Company repurchased $4 million (principal balance) of its convertible senior notes outstanding. Repurchases to date have totaled $82 million (principal balance) or 95%, of the originally issued principal amount, thereby eliminating the need for the Company to issue 10.4 million shares when the notes may have otherwise converted to common stock. In addition, during the second quarter the Company repurchased 0.8 million shares of its common stock for approximately $18 million under its previously announced $100 million stock repurchase program. Ranked #1 nationally for on-time performance for the months of March, April and May 2015. Ranked as one of the top domestic airlines by Travel + Leisure for 2015. The comprehensive interior retrofit of the Company’s neighbor island fleet remains on schedule for completion in the fourth quarter of 2015 with 12 of 18 Boeing 717 aircraft completed to date. Added an A330-200 aircraft under lease financing and retired a Boeing 767-300 at the end of its lease. Updated the fleet plan and entered into a six-year lease agreement for one A330-200 with a delivery date of summer 2016 and accelerated the planned retirement date of certain of its Boeing 767-300 aircraft. Announced the purchase of three ATR 72 turbo-prop aircraft in an all-cargo configuration for expansion of its cargo service. Los Angeles to Kona, three-times-weekly, and Los Angeles to Lihu’e, four-times-weekly, summer seasonal service reintroduced in May. Oakland to Kona, three-times-weekly and Oakland to Lihu’e, four-times-weekly, summer seasonal service reintroduced in May. Los Angeles to Maui second daily seasonal summer service reintroduced in May. 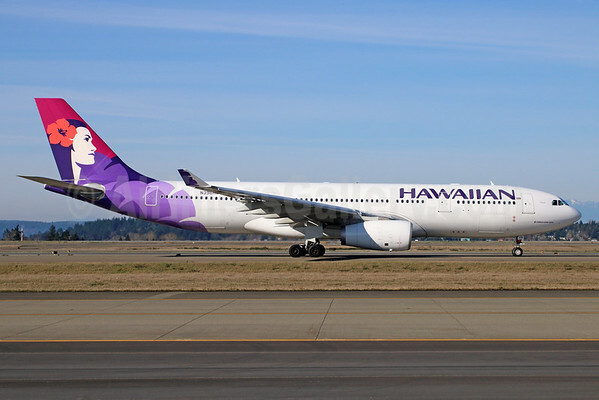 Announced year round service from Los Angeles to Lihu’e, three-times-weekly, beginning in January 2016. Copyright Photo: Michael B. Ing/AirlinersGallery.com. Airbus A330-243 N396HA (msn 1488) taxies to the runway at Seattle-Tacoma International Airport (SEA). This entry was posted in Hawaiian Airlines, Hawaiian Holdings and tagged 1488, A330, A330-200, A330-243, Airbus, Airbus A330, Airbus A330-200, Hawaiian Airlines, Hawaiian Holdings, N396HA, SEA, Seattle/Tacoma on July 29, 2015 by Bruce Drum.